La Nuit des Arts—which actually spans three days—is an initiative of the City of Roubaix: twice a year, for the past ten years, forty venues around Roubaix, each one very different from the next, open their doors to showcase a wide variety of art: privateworkshops and studios, museums, restaurants and bookshops serve as venues forpainting, drawing, sculpture, ceramics, photography, art installations, and more. The May edition, which runs in conjunction with Nuit des Musées (Night of the Museums), also coincides with the Comic Book and Graphic Arts exhibition,whereas the December edition, held on the first weekend of the month, coincides with la Braderiede l’art and the Marché des modes. Dreamed up in 1991 by the Art Point M collective, la Braderie de l’Art is a unique event held at La Condition Publique: a 24-hour marathon in which graffiti artists, illustrators and various other makers and creators put on a live public “show”, using reclaimed objects and materials. 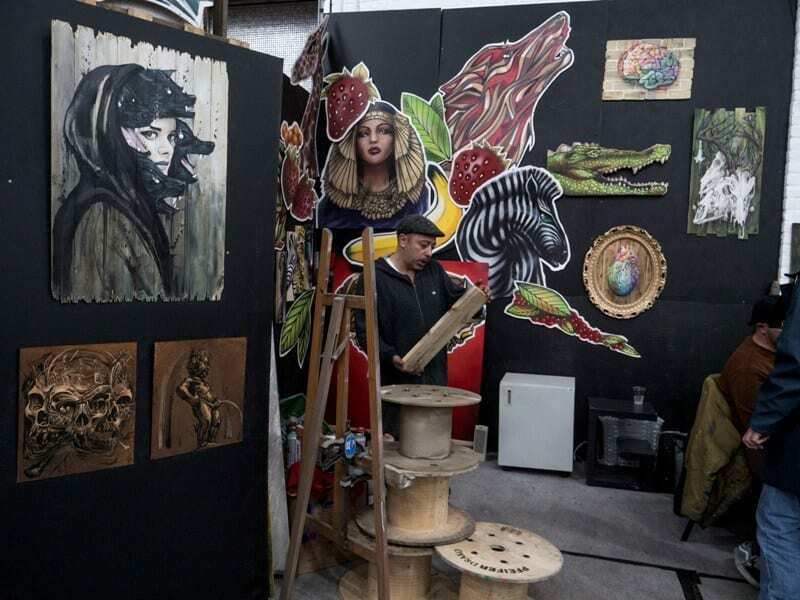 The finished pieces are sold on the spot, ranging in price from €1,000 to €3,000.